Thinking about what the next four years could hold not only for America but the whole world with a Trump presidency makes me think about the 37th president. 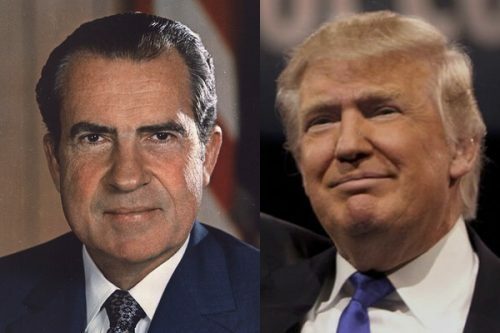 That president was Richard Milhous Nixon. The two do seem, to me, share similar traits. Both seem to be paranoid about people out to get them. Neither of them like the press. Finally, I’m sure that Trump is writing a similar list to that of Nixon. Trump’s list is probably a lot longer and includes “fake news” sites such as the BBC, CNN and other prestigious news organisations. One that’ll probably never appear is the Breitbart blog site. Another similarity they both share is the systematic dismantling projects of a president they despised. Obama & Kennedy. Possibly two of the greatest presidents of the last 60 years. Apollo and the moon program for one & the Affordable Care Act ( Obamacare ) for the other. One put back manned space exploration for decades; something we are still suffering from. The other could let millions die because of his political hatred. The next four years do seem bleak for America but you have to remember that a lot of seats in the Senate are up for re-election in 2018 so Republican Senators may have to start to be worried for their continuing job prospects. Trump has already broken some records for an incoming President. Lowest approval rating for any President-elect in decades at 44%. This is compared to 83% for his predecessor in 2008. Now let us see if they both finish their time as president in similar ways. Being brought to stand before the Senate to be impeached. At least one resigned to keep some of his honour intact. Finally, it does seem that America’s President-elect is trying to turn himself more and more into a 3rd rate tin-pot dictator. 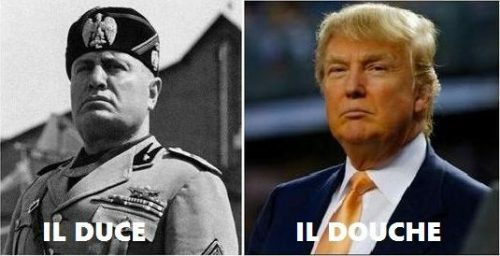 Along the lines of Benito Mussolini. Trumpolini in other words. He already has the the “Red Hats” running ahead of him.